You know I absolutely love the Pura Body Naturals MuruMuru Moisture Milk (Tahitian Vanilla Scent). It’s rich, creamy and very hydrating on wet, damp and dry hair. Very consistent results each and every time. I use it as a leave-in and daily moisturizer. I actually stock up on multiples when there is a sale if that tells you anything. It has a sweet smell but not migraine headache sweet. Trust, I know – I suffer from migraines. Great shelf life – I keep a lot of things in rotation and from opening to product completion, it might have taken 6 months to fully use. The Moisture Milk didn’t mold and continuously performed. I stored it in a cool, dark place. Fragrance options include: Unscented, Tahitian Vanilla and Lemongrass Blend. Unfortunately, I’m out of stock on the MuruMuru and cannot show you the consistency. However, the good news is, this Pura sale is right on time. Water, murumuru butter, BTMS (behentrimonium sulfate and cetearyl alcohol), castor bean oil, palm oil, avocado oil, chamomile extract, vitamin E, phenoxyethanol, capryl glycol (paraben and formaldehyde free preservative), fragrance and/or essential oil. 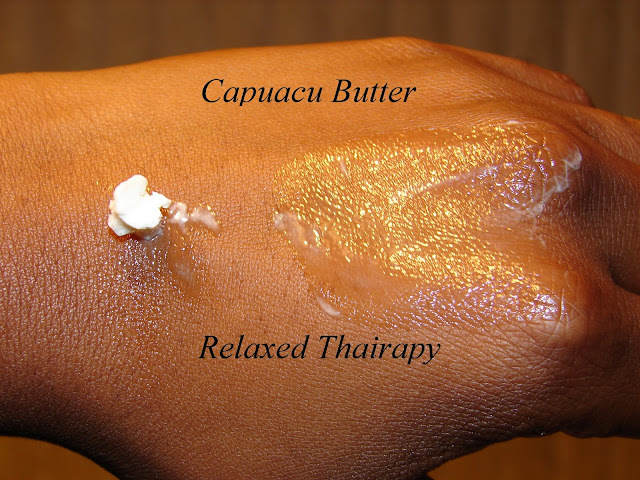 Cupuacu Hair Butter (Tahitian Vanilla Scent) – smooth texture and provides a great seal. Perfect for hair and body. I tend to use this when I’m in need of heavy sealing when the ends need some TLC and/or during winter months. Great shelf life. My butter has lasted a very long time – a good year+. I store it in a cool, dark place. Do know a little goes a long way. I have also used it as body butter and it works great for that as well. It’s smells delicious as well — the scent smells the same as MuruMuru Moisture Milk. Fragrance options include: Unscented, Tahitian Vanilla and Lemongrass Blend. The butter pretty much melts on contact. A rich creamy blend of natural butters and oils to combat dry, brittle hair. Cupuacu is well known for its high fatty acid content which benefits dry, damaged hair while protecting moisture and leaving hair soft and silky. I love products, what can I say. I like sapote for its softening properties. Is it a necessity? No. Is it lovely enough to purchase? Yes. It’s one of the few oils that actually soften my hair. I rate this oil in the category of argan. Oh and, a little goes a long way. The smell is bland — almost practically no smell at all but that’s not a bad thing. It’s just not scenty like the Moisture Milk & Cupuacu Butter. This oil also serves as a great oil for oil rinsing. One thing to point out is this oil will solidify. You might even notice clumps of white chunks settling at the bottom of the bottle. Once the oil touches my hand, it quickly melts on contact. Similar to castor but not as thick. It spreads easier than castor and I get no broken strands when apply product. Fine haired ladies may need to use a very limited amount to ensure it does not weigh the hair down. Sapote restores the health of natural or chemically relaxed hair while improving manageability leaving your hair soft and luxurious. Sapote Hair Lotion – Unfortunately, the sapote lotion was too light of a product for my thick/coarse hair. My hair just soaked all of it up and it was thirsty for more. I lathered more on but my hair kept wanting more. This product would be great for someone with fine strands that doesn’t need heavy product weighing down the strands. Fragrance options include: Unscented, Tahitian Vanilla and Lemongrass Blend. I no longer have this product in my stash to show the consistency. It was a thinner product than MuruMuru. 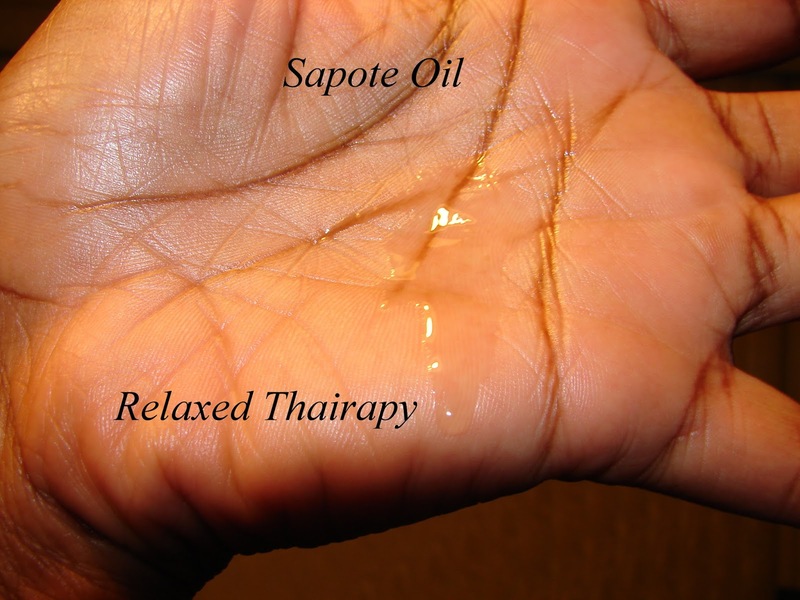 Sapote Oil is grown throughout the West Indies, Central and South America. It’s rich in vitamins A, C, and plant proteins, carbohydrates, iron, potassium, and calcium. Sapote restores the health of natural or chemically relaxed hair while improving manageability leaving your hair soft and luxurious. Water, Behentrimonium Metholsulfate, Cetearyl Alcohol, Organic Pouteria (Sapote) Sapota, Orbignya Oleifera (Babassu) Seed Oil, Theobroma grandiflorum (Cupuacu) Butter, Organic Bertholletia excelsa (Brazil) Nut Oil, Coconut Milk Powder, Green Tea Extract, Banana Fruit Powder, Mango Fruit Powder, Tocopherol, Phenoxyethanol, and Capryl Glycol **Note: label identifies second ingredient as Behentrimonium Choride which is a misprint the correct ingredients are listed above. Chocolate Hair Smoothie – This smoothie contains wheat protein – enough said. If you follow my blog, you know my hair starts acting some kind of way and be threatening to throw up the deuces when wheat protein comes near. Back when the the smoothie was a hot item on my must-try list, I was not aware of my hair’s wheat protein phobia. Now knowing what I do, this product clearly did not work for me because of the pesky ingredient. Don’t let my experience alarm you. If you hair thrives on wheat protein, go for it. I don’t recall a strong chocolate scent but again, it’s been quite sometime since I’ve given this baby a try. I no longer have this product in my stash but it was thick and creamy. Chocolate goodness for your hair. Great boost of vitamins and minerals for soft, nourished hair. What are your Pura Body Naturals favorites? Thanks for this. Read about the sale and wasnt sure what to pick. will try the milk and sapote oil. Love this Blog, thanks for the great info, very clear and fair! 2oz last a very long time which is why it probably went so quick. I wish they were on sale as well. Maybe you can snag it on Black Friday.